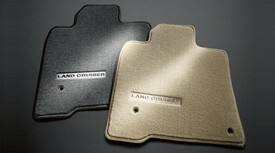 Keeping the interior of your Land Cruiser clean can become a chore if you don’t have floor mats protecting your carpet. OEM Toyota floor mats are a perfect fit – unlike universal mats - and will keep dirt, mud, snow, and ice from ruining the interior carpet of your SUV. When you need to clean them, just pull them out and clean them. They will protect your carpet from wear, and that adds to the eventual resale value of your vehicle. 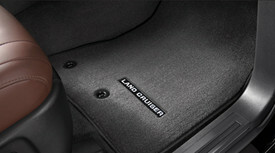 We carry genuine Land Cruiser floor mats in a variety of colors – black, brown, gray, ivory, etc. – and styles, carpet and heavy duty all weather mats included. At Olathe Toyota Parts Center, we carry only real Toyota parts and accessories. We offer no hassle returns and fast shipping on all Land Cruiser parts and accessories, so you can shop with confidence. 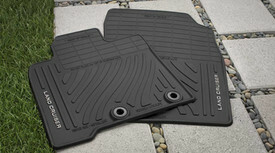 Order a set of Land Cruiser floor mats today.